Wow location location location! 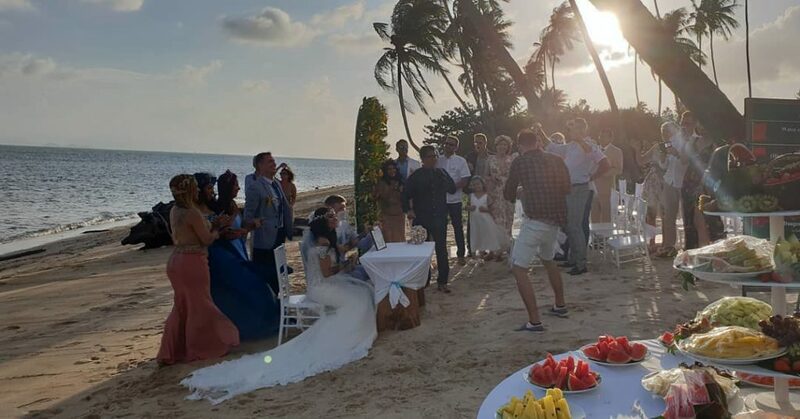 It’s nice having a beach wedding on Koh Samui, but if you’re really lucky and have the sun come out to play and set over your ceremony that’s pretty much bliss. It was a fine days weather in Ban Talingam. January is a great month of weddings on Koh Samui. It’s less hot and the sea is all the way in making some of the less beautiful beaches look absolutely gorgeous. The wedding today was being held at the Centara Coconut Beach Resort, somewhere I have been coming to personally for the last nearly 20 years! Back then it was just simple bungalows now it looks excellent and great place to get wed.
What a fun crowd this group turn out to be and the entertainment was first class (not just myself DJing) The had a belly dancer in their group who livened things up! There was also fireworks, Fire dancers, Thai dancers and a ladyboy Cabaret – A wedding I won’t forget in a long while!